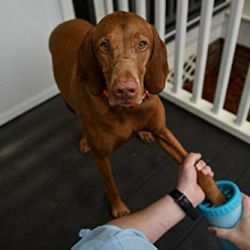 On July 1, 2015, New Hampshire became the fifteenth state to adopt a hands-free law that prohibits the use of hand-held electronic devices unless they are supported by a Bluetooth or other hands-free technology. Now, it’s hard to buy a car today without Bluetooth support, but what if you have an older car? Sure, waiting until you get to yourdestination, or pulling off the road, is the safest bet, but most of us are conditioned by now to believing that incoming calls cannot be ignored. (When did this happen?) 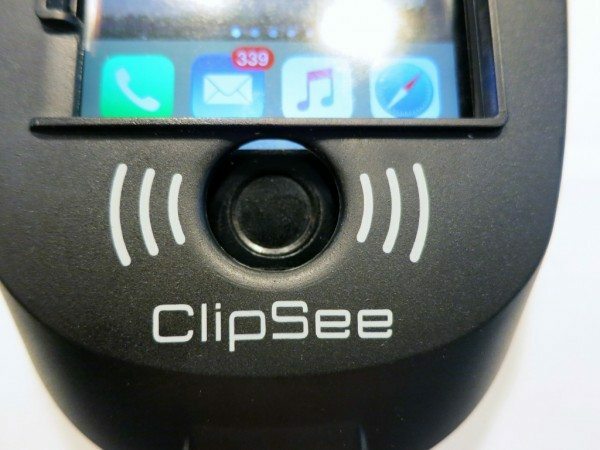 Enter an inexpensive, slightly inelegant solution for iPhone users called ClipSee. So let’s take a look. 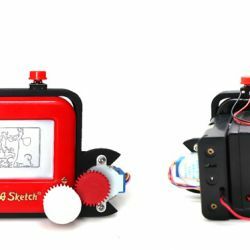 ClipSee is a low-tech gadget without any electronics, but it’s an ingenious solution. 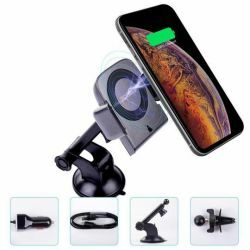 ClipSee attaches to your seat belt and cradles your iPhone on your chest, where it funnels and amplifies iPhone audio up to you and places the iPhone microphone at the right location to pick up your voice. ClipSee was designed for smaller iPhones, so it works best with iPhone models 4 and 5 with or without most cases, but it claims on the Amazon site that it will accept an iPhone 6 without a case. But if you haven’t upgraded to a car with Bluetooth, you may also be a person who holds on to older phones. 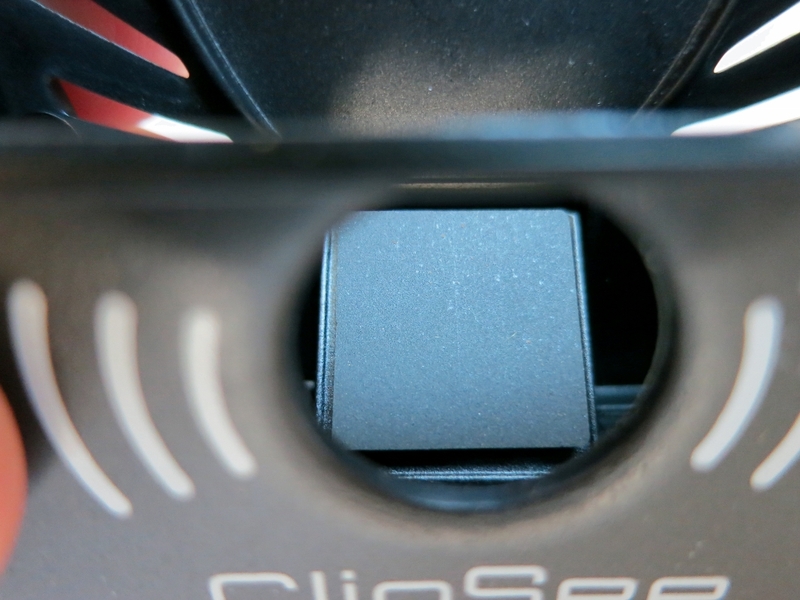 The box is simple, containing the black plastic ClipSee and a foldout Quick Start Guide. The outside of the box has a template showing the maximum case size that will fit the ClipSee: 2.57” wide x 0.55” deep. That’s a warning sign for the iPhone 6, which is 2.64” wide. 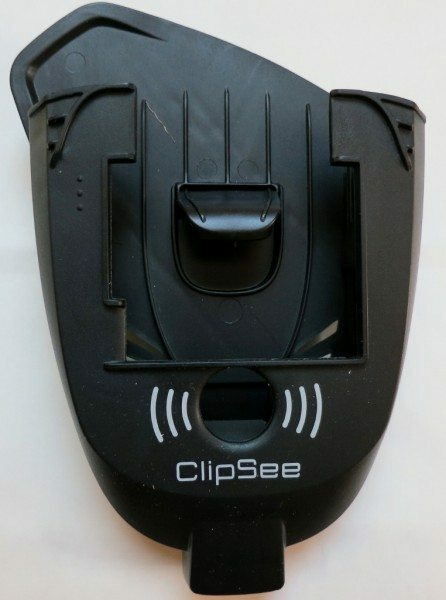 The ClipSee device looks decidedly low-tech. It’s a simple piece of black plastic to hold the iPhone, with a clip on the back to attach it to your car’s shoulder belt. Following the simple, 3-step instructions, I first grabbed Emilie’s cell phone to see if it would fit in the ClipSee. 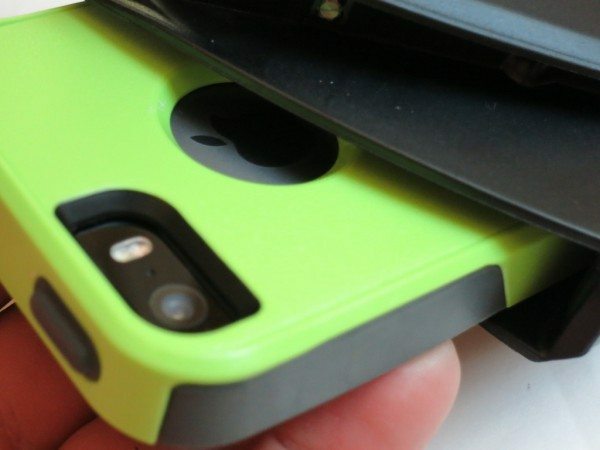 According to the template on the box, it should just barely make it, including the Otterbox case. 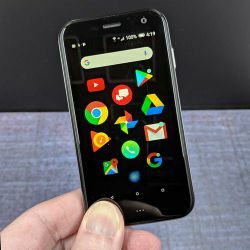 In the picture above, the phone’s dimensions exactly match the template. Actually, it seems to fit just fine. 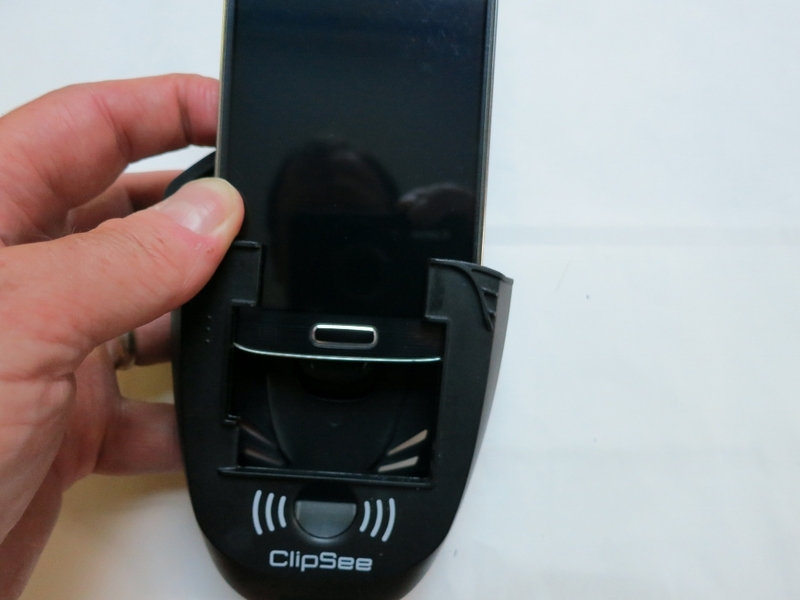 The second step in the instructions is to turn a dial at the bottom back of the ClipSee device. 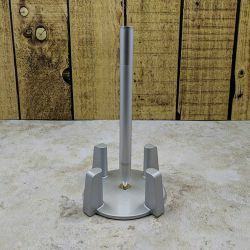 This operates a screw mechanism to raise and lower an internal wedge that raises or lowers the phone to the desired height in the ClipSee holster. The correct height centers the home button in a circular cutout in the holster. Mission accomplished. 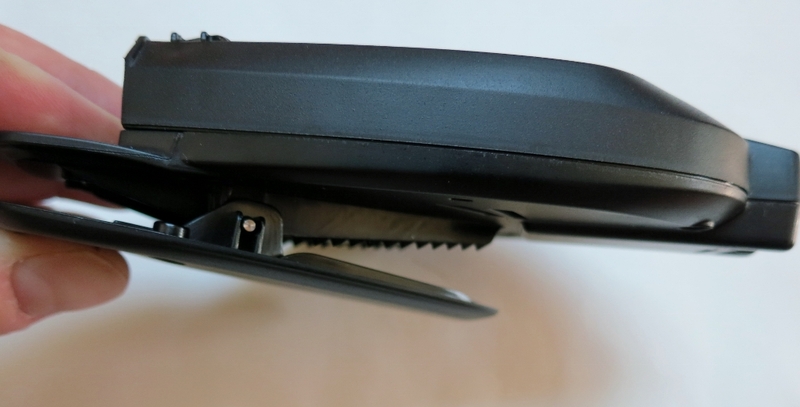 The last step is to clip the device to your shoulder belt. This puts the microphone just below your mouth and directs the audio from the iPhone’s speakerphone up toward your ears. I don’t have an iPhone 6 to test with to see if it would fit. For the record, my Samsung Galaxy S4, at 2.75” wide, definitely does NOT fit. The User Guide also discusses making and receiving calls. 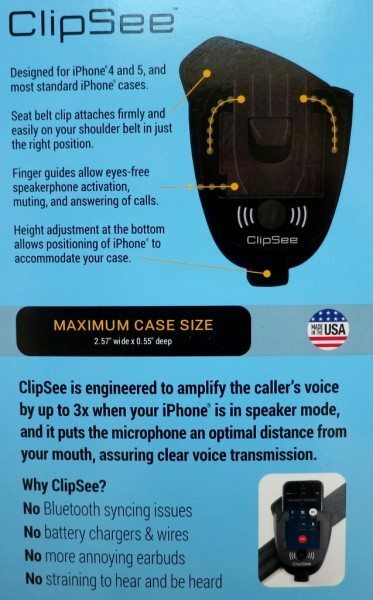 The first, and easiest, approach is to use one’s normal procedure to initiate or answer a call, then slip the iPhone into ClipSee to talk hands-free. While simple, it means that safety and hands-free laws dictate that you pull off the road to make or receive a call hands-free. For people who use their phone a lot, that’s probably not acceptable. 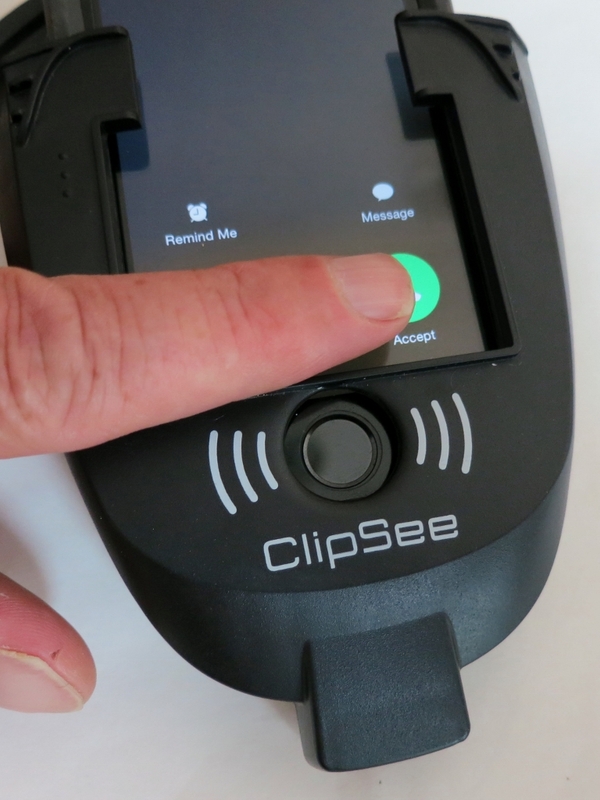 ClipSee does its best to make true hands-free operation possible. If your iPhone supports Siri, you can use the Apple assistant to make a call by pressing the Home button – previously centered in the circular cutout so easy to find without looking – and then speaking the voice command to place a call. 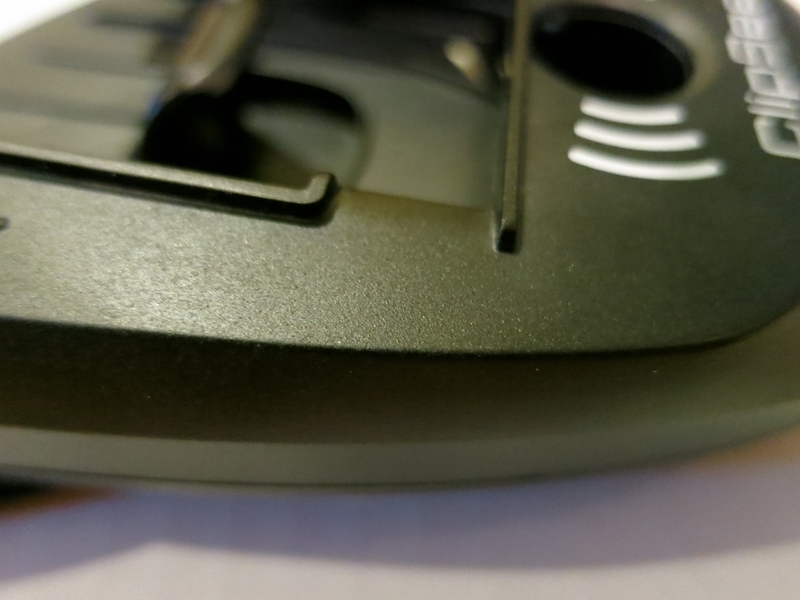 There is a helpful finder guide next to the lower part of the exposed phone screen to guide your finger where you need to press to answer (or reject) an incoming call. Because it’s at the bottom of the exposed screen, the notched finger guide is less helpful than the screen frame itself. You need to train yourself to remember which side of the screen to push – backwards when it’s on your shoulder belt! – to accept or reject the call. 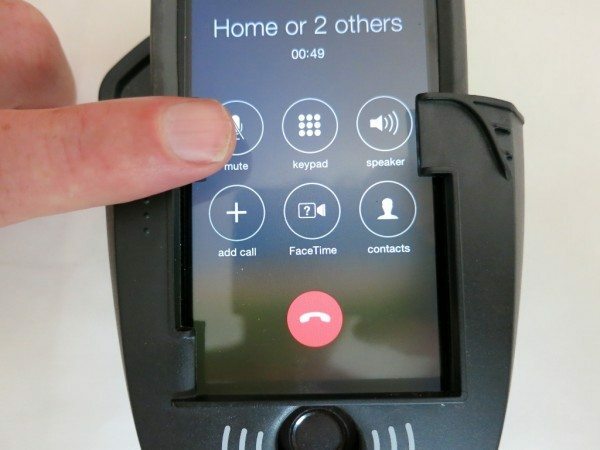 There are also finger guides higher on the screen to direct your finger, without looking, to the place on the screen to activate your speakerphone when the call is connected. 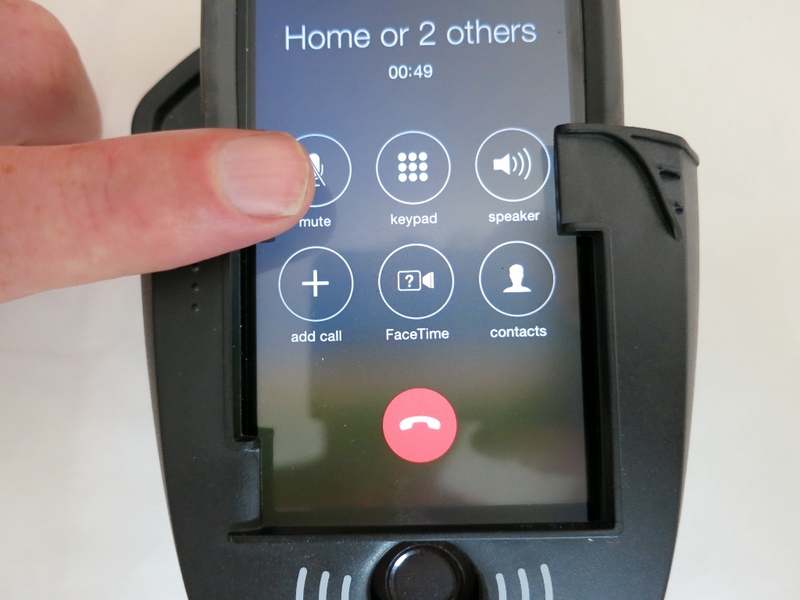 On the other side of the screen, the finger guide can be used to mute calls. 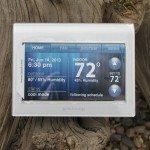 These guides are useful, putting your finger at the correct height on the screen to perform the desired function. Again, you’d need to use this somewhat regularly for it to become second nature. A tip from the ClipSee website says that, if you use the car for a majority of your phone calls, you can make the speakerphone the default for incoming calls (iOS7) or incoming and outgoing calls (iOS8). This would eliminate a button push while using ClipSee. Is the phone secure in the holder? Pretty much. 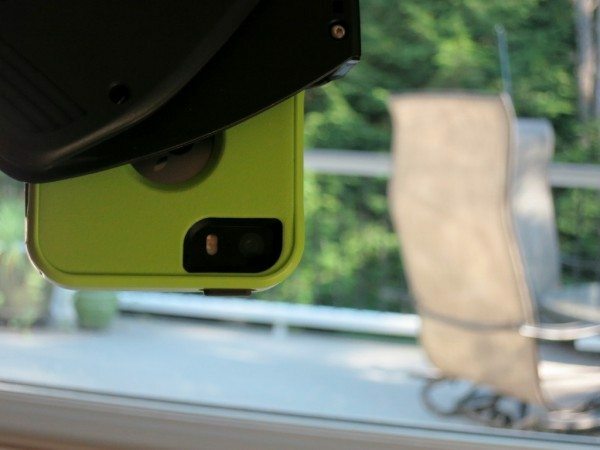 While it’s easy to slide the iPhone in and out of ClipSee, there is enough friction that it’s not going to leap out on its own. In fact, I held ClipSee upside down and the iPhone didn’t fall out (although it would have with a couple of good shakes). At this point, I handed the device over to Emilie for the use test. Emilie is on the phone more often than not when she’s driving. Her Acura RDX does have Bluetooth for hands-free talking as well voice-activated dialing and answering calls. So her feedback is based on comparison with the high-tech approach rather than no hands-free system at all. 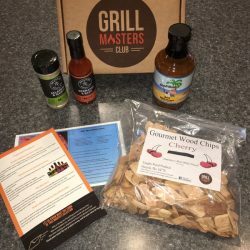 I was actually rather surprised at how positive her feedback was. The best thing about ClipSee, according to Emilie, is the audio quality. 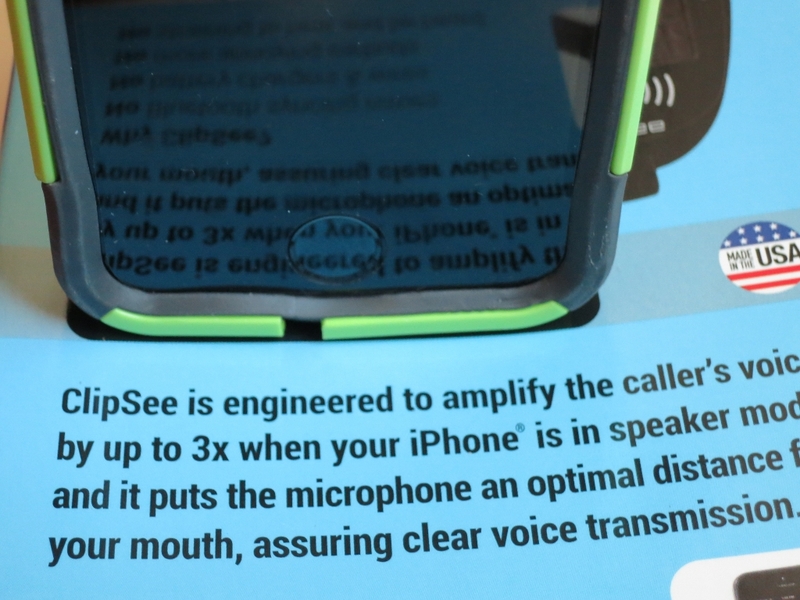 ClipSee does a great job of amplifying the speakerphone volume, and Emilie finds the direct audio via ClipSee to sound much less distorted than the audio passing via Bluetooth through the car’s speakers. People on the other end of the call were also less likely to complain about a noisy connection. However, Emilie found the extra learning curve required for hands-free call initiation to take more effort than she was willing to expend. She will use the car system to receive or place a call before using ClipSee. 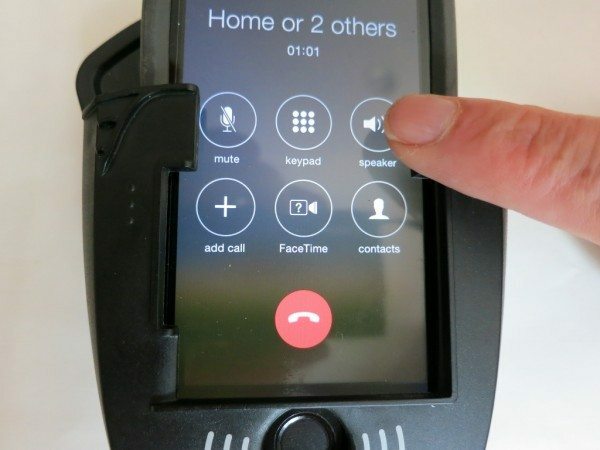 Nevertheless, if she finds it hard to hear, or if the person on the other end of the call complains about noise, she frequently switches the phone into the ClipSee cradle. ClipSee is not free of operational inconveniences. 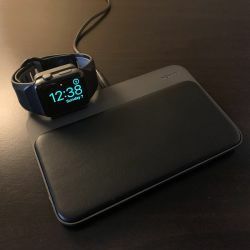 One big issue relates to the claimed benefit of “No battery chargers or wires.” That’s all well and good, but Emilie uses her car time as a valuable phone-charging opportunity. 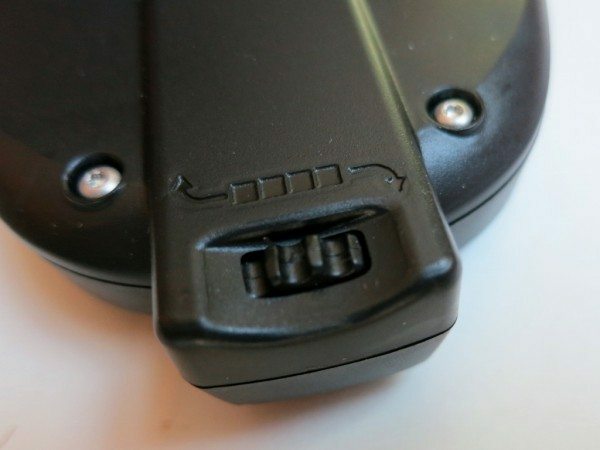 You wouldn’t really want to run a charging cable up to your chest while driving, and ClipSee doesn’t support it anyway, covering the charging port. The other drawback is the “geek factor.” Emilie always used to make fun of my Blackberry holster back in the day, and ClipSee takes that look to the next level. Still, ClipSee is a great solution for Emilie when she’s tooling down the highway talking on the phone with maximum cabin noise (and nobody watching!). So she’s kept it in the car, clipped to the visor and ready when she needs it. One thing that Emilie hasn’t tried, but is a feature supported by ClipSee and not by her car’s technology, is to use Siri to support hands-free texting. Siri will read incoming texts and also send text messages using voice commands. 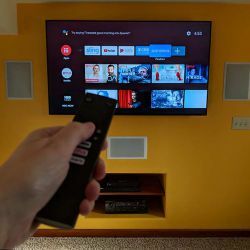 For many people, that feature, combined with clearer audio, could justify a ClipSee purchase. At $10, ClipSee is a great low-tech gadget for enhancing safety for those of us who insist on phoning (and even texting) while driving. 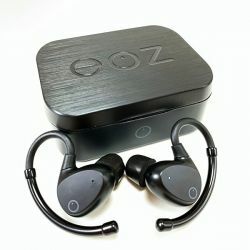 The product has a limited shelf life, partly because more and more cars support built-in hands-free support – and who’s going to use a $10 piece of dorky plastic when they just paid hundreds of dollars for the Bluetooth technology package? Furthermore, without upgrading the product to support the larger iPhone 6, ClipSee will follow the older iPhones to the Land of Obsolescence. Still, you might find ClipSee just the ticket to take you, your beloved tiny iPhone, and your even more beloved low-tech rust bucket down the road (legally) a few more miles. 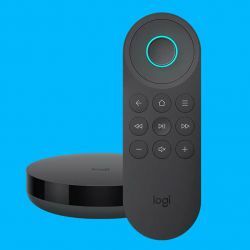 Source: The sample for this review was provided by Acoustic Gadgets LLC. 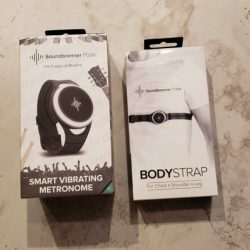 Please visit their site for more info about this product or Amazon to order one. 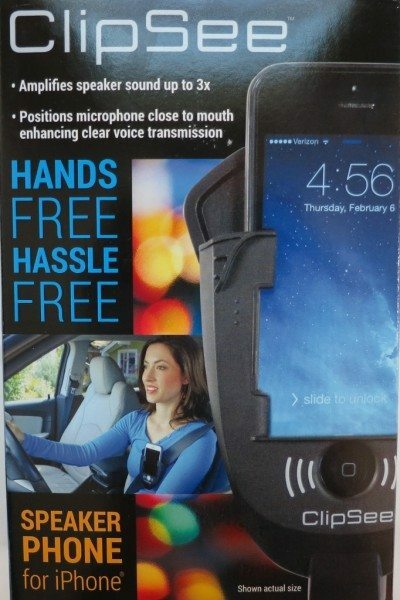 I wish the Gadgeteer wouldn’t review devices like this which encourage talking on a cell phone while driving. Talking on a cell phone while driving is worse than driving drunk! 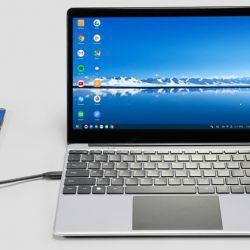 @Sandee, That’s a valid point, and interesting studies that you’ve linked. I did try to point out that it’s always safer not to engage with the phone at all while driving, but I think that can of worms is empty and most people will continue to talk while driving. My best hope is for the perfection and adoption of automated driving systems that allow people to talk on the phone while NOT driving. Meanwhile, legislation remains focused on hands-free systems, so I think it’s valid to review gadgets that attempt to make the roads safer by getting phones out of drivers’ hands. Of course, that not only may not make drivers less distracted, but also frees up the hands to get back to eating, shaving, applying make-up, reading the paper and all those other dangerous activities that drivers have been doing since well before phones came along! Yes, you did suggest pulling off the road or waiting till you finish the ride, but it needs to be spelled out distinctly that any cell phone use is very dangerous. I hope that legislation will be enacted that forbids any cell phone use by the driver. Hands free or not. And that car makers remove their features for drivers to use the phone if the car is moving. What do you think the reaction would be if car makers created a system where drivers could automatically sip a drink behind the wheel. Not just water but beer, scotch, wine, any thing. That is exactly what they are doing by facilitating cell phone use while driving. Worse. The studies clearly show that talking on the phone is worse than driving drunk. I let my wife answer all calls, even my phone, when we are in the car. And if I’m alone, I let it move to voice mail. However, my new Apple Watch does let me refuse a call with a click on the watch face and then a click on a pre-set message that goes to the person’s text. So I can “answer” the phone without speaking. I have a few friends from California who drive alone for long distances and think it’s a good idea to catch up on their phone responses during their trips. Whenever I find out they are calling me while driving I ask them to call me back later. I don’t think I could handle hearing them crash. Anyway, I think you’re in the wise minority with your decision to avoid phone use while driving. A quick google search cited surveys showing 58% and 69% of adults using their phones while driving. That’s a tough broad-based habit to outlaw. Still, I’ll be more than happy to review a Tesla or Google car with an automated drive system as soon as I’m offered one! The technology is getting close to ready and, even though legal and societal issues may delay deployment longer than I’d like, my bet is that we’ll see this remedy for distracted driving before hands-free phone use is outlawed.